Photo: Francisco Herculano de Oliveira. José Gabriel da Costa was born on February 10th, 1922, in the town of Coração de Maria near Feira de Santana in Bahia. Son of Manoel Gabriel da Costa and Prima Feliciana da Costa, small-scale farmers, he was the eighth of 14 children, raised in the Catholic faith and in the daily work of the farm. The 10th of February is a consecrated day in the União do Vegetal. José, as he was called at home, learned to read and write by himself and only went to school for a short period- three months. His teacher told his father that they did not have anything more to teach him, and because there were no other schools in the region, José had completed his studies. At the age of 20, he went to Salvador, the capital of Bahia, to work in a shop and as a streetcar driver. In the capital, he encountered some religions, “searching for reality”, as his brother Antônio Gabriel says. There, he attended Candomblé rituals, where he presented himself as ‘Sultão das Matas’ (Sultan of the Forest). On Sundays, he played capoeira on Amaralina beach, where he was called Zé Bahia, known for his agility. His stay in Salvador did not last long. In the middle of World War II (1943), the Brazilian government, aiming to increase the extraction of latex from native Amazonian rubber trees, recruited an army of “rubber soldiers” and gave the option to the young people from the northeast of Brazil to go to the Amazon to harvest rubber. In 1944, without having the opportunity to say goodbye, José Gabriel writes a letter to his family and embarks on a boat to Belém, in the state of Pará, on his way to his final destination of Porto Velho, then to the capitol of the Guaporé Federal Territory, today the state of Rondônia. 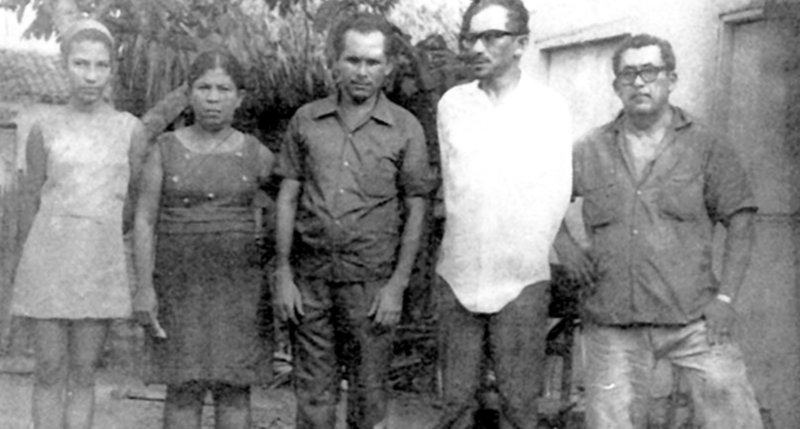 In that region, José Gabriel da Costa worked in different rubber tapping areas of Acre, Rondônia and also Bolívia, where he encountered the Hoasca Tea (ayahuasca), in April of 1959. The video below tells the story of the life of Mestre Gabriel up to his encounter with the Hoasca Tea and the creation of the União do Vegetal. – José Gabriel da Costa is born on February 10, 1922, in the town Coração de Maria, near Feira de Santana, in the state of Bahia. – In 1944, he enlists himself as a “rubber soldier.” He travels by boat from Salvador, Bahia, to Belém, Pará; and from there goes to Porto Velho (Guaporé Federal Territory). – From 1944 to 1946, he was a rubber tapper in the rubber tapping regions of Bom Futuro and Triunfo. Upon returning to Porto Velho, he worked with providing firewood for the Madeira Mamoré Railroad, and later, in the São José Hospital in Porto Velho, as a nursing assistant. – In 1947 he met Raimunda Ferreira da Costa, nicknamed “Pequenina”, and married her. – Between 1950 and 1958, from Porto Velho he went to the rubber-tapping region with his family, living for a period in the Territory of Guaporé, now the state of Rondônia, and returned to the Capitol. He made this journey several times, prior to encountering the Hoasca Tea. – From 1959 to 1964, Mestre Gabriel lived in the rubber tapping regions of Guarapari and Sunta, on the Bolivian banks of the Abunã river, bordering Acre. In April of 1959, he had his first contact with the Hoasca Tea, which was distributed to people without a ritual or a defined doctrine. This begins his intention of utilizing the tea in an orderly and beneficial way. – On July 22, 1961, he creates the União do Vegetal with his wife Pequenina, his children and some rubber tappers who were present. He continues distributing the tea, now with ritual and doctrine. – In January of 1965, Mestre Gabriel and his family move to Porto Velho, where the UDV was organized first as the Beneficent Association União do Vegetal, and then in 1970 as Centro Espírita Beneficente União do Vegetal (Beneficent Spiritist Center União do Vegetal), setting up its first headquarters on Abunã street. – On September 24, 1971, he disincarnates in Brasília, the capital of Brazil.